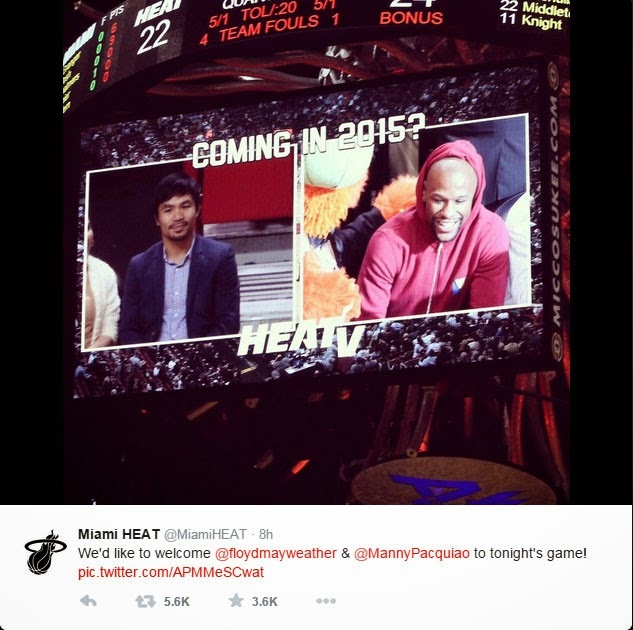 Even before the Mega Fight becomes a reality, boxing icons Manny Pacquiao and Floyd Mayweather Jr. met in an NBA game between Miami Heat and Milwaukee Bucks on January 28, 2015 and had roused the hopes of boxing fans that the most awaited fight will finally happen. The boxing rivals were seen watching on the courtside and were even put into spotlight as the cameras focused on them and their faces put up at the big screens of American Airlines Arena with the written caption, ‘Coming in 2015’. It has been reported that during the halftime the two shook hands and talked personally and even exchanged personal numbers. Pacquiao said that Mayweather had given his number to him and they will talk personally. This news had rekindled the hopes of their fans that before the two retire, they will face each other in the boxing ring. As reported by ABSCBN News, Pacquiao shared that the meeting during the NBA game was the first time he was able to personally talk with the American Boxing Icon. Pacman shared that it was a minute before the game’s halftime that he learned that Mayweather would approach him. On the other hand, Mayweather had shared that his intention with regards to meeting with Pacquiao personally was to talk about the lies allegedly hindering their most anticipated fight. The meeting seemed to be unplanned as Pacquiao’s flight was one of the canceled flights due to Winter Storm Juno. Ethan J. Skolnick of Bleacher Report also reported that the Filipino Boxing Icon had visited the Miami Heat’s locker room before the game as it is known that the team’s coach Erik Spoelstra has Filipino roots. It was early this year that Mayweather verbally accepted Pacquiao’s challenge but he is still yet to sign the contract formally.